Bayliner Capri 1952. Year 1996. Engine - 3 litre Mercruiser LX with Alfa one stern leg. This is a great boat, we have used it for cruising the inner Hauraki gulf. Based in Stillwater we often go up around the outside of Kawau fishing, then home, a round trip of 80 kilometres. We go out to the Noises a lot and across to Waiheke. The boat is very economical at around 2k/ litre, very reliable otherwise the boss wouldn't come. 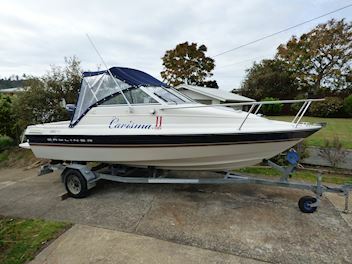 The boat is presented in excellent condition with many upgrades and improvements. In 2015 the boat had a new exhaust manifold, valve grind, head planed, and new head gasket fitted. A new Savage heat exchanger was fitted making the engine fresh water cooled. Water pump and front timing cover was replaced. Alternator and starter motor were replaced. Two new batteries fitted. Electrical wiring was serviced and replaced where necessary. The stern leg was checked and fitted with a new impellor and housing. A new 1500 gph bilge pump was fitted. New front Hatch. In 2017 the stern leg shaft seals were replaced (ran over a fishing line at the boat ramp. Never run over a fishing line, it is expensive!) In 2018 The seats were recovered and new carpet laid on the floor. 15 hp Yamaha Not Included. Now unfortunately it is for sale so I will not be distracted from working on my old keel boat.